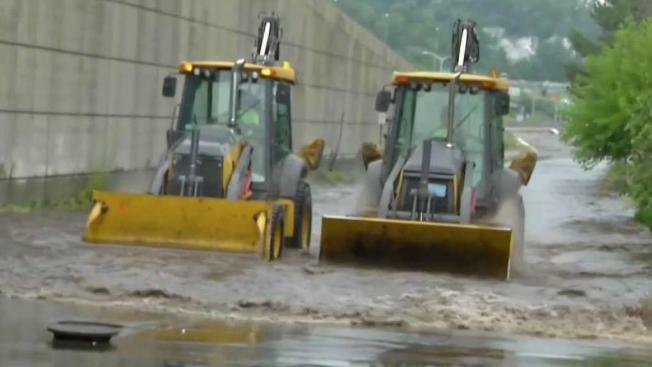 A water main break caused major flooding Tuesday in Worcester, Massachusetts. 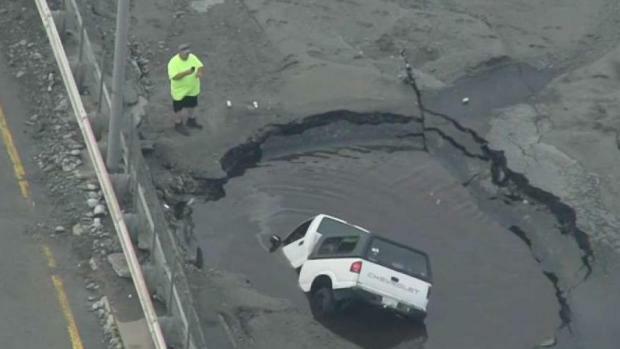 Crews are working to determine the cause of a water main break that flooded roads Tuesday in Worcester, Massachusetts, creating a massive sinkhole. The break was discovered just after 3 p.m. on Stores Street and Shore Drive, according to the Worcester Department of Public Works. It left streets in the Greendale neighborhood underwater, with at least five cars being caught in the flood. One man needed to be rescued after driving through floodwaters and falling into a sinkhole. "I thought it was just a puddle, so I gassed it to go through it," said Vincent McCue of Leicester. The sinkhole nearly swallowed his truck. Authorities are investigating the cause of a major water main break that flooded part of Worcester, Massachusetts. "I seen a couple barrels that I knew went to the highway straight ... so I didn't think nothing of it, there were no signs or anything," said McCue. "There were a bunch of people there and no one said anything like, 'Hey, whoa, stop.'" McCue's truck actually landed on the pipe, as water and sand began pouring in through his open windows. He crawled out onto the hood, leaving his keys in the ignition. Worcester Police Chief Steve Sargent was the only one to pull up on the scene. "I don't live far from there," Sargent said. "I was actually going down to check the damage ... I seen this person sitting on the car. It just happened, so I called it in." Lt. Dan Fallon joined Sargent to make a quick water rescue. "We just put a little human chain together, grabbed him and pulled him in, and jsut brought him over to safety," Sargent said. Wednesday afternoon, the giant crack in the 24-inch water main could be seen. Roads in the immediate area remained closed Wednesday. Water service has been restored to nearly everyone in the Greendale neighborhood. Residents were warned that their water pressure would be affected and the color would be murky as crews work on repairs. However, officials said the tap water was safe to drink. "We've increased our chlorine dose to make sure it's safe to drink," Phillip Guerin of the Worcester Water and Sewer Department said. Anyone who still experiences problems with their water's pressure is encouraged to contact the Worcester Water Department at 508-799-1485.